The AWS scale is a great tool used by our barista's to weigh shots. The blue backlight is very easy to see and protected buttons hold up to the occasional espresso spills (keeping in mind that this scale is NOT waterproof!!). A durable, backlit pocket scale. Both will hold a portafilter and allow for taring. Our trainer Sal's favorite scale! 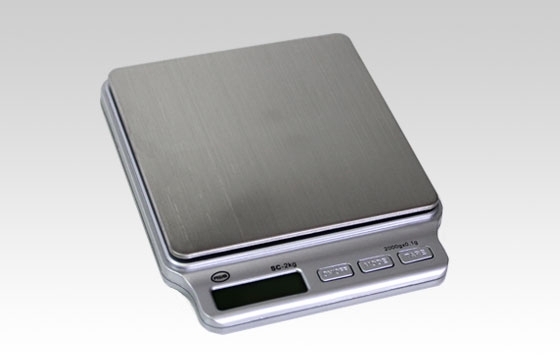 The AWS Series is a great durable and compact pocket scale for those who are seeking the on the go high-tech portable scale. The backlit LCD display helps make the numbers viewable and easy to read. The intuitive protective cover provides protection for the scale. With the smooth stainless steel weighing surface clean up is easy. Push buttons on the scale give you full control such as: switching modes grams, ounces, troy ounces, pennyweights and tarring. 10 year warranty.